Photovoltaic (in short form called PV) is basically the conversion of sun light into electrical current. The current generated by the photovoltaic system is primarily fed into the public power grid, but can also be used for selective off grid applications such as the charging of batteries. Semiconductor cells are the core component of a photovoltaic panel. Several panels combined make a PV string or solar module. The Power generated in photovoltaic systems is measured in kWp (Kilowatt peak). An average of photovoltaic system of 1kWp saves the environment about 0.5 tonnes of carbon dioxide and other harmful particles. Photons emitted by the sun, generate DC current in the PV panels, which can be measured all the way down to the inverter box. For maintenance purposes or in case of emergencies it is therefore necessary to disconnect the DC load. This termination can either be achieved by using connectors or preferable DC rated disconnect switches. Safety is of the highest priority! According to IEC 60364-7 it is mandatory to have a DC main or DC load break switch between the PV panels and the inverter box. Salzer has stepped up to this challenge and offers DC load breaking switches according to IEC 60364-7-712:2002 and IEC 60947-3. 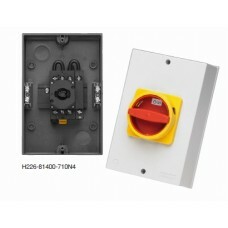 For outdoor installations, Salzer offers DC rated switches in polycarbonate encolsures with IP66 rating. Naturally we also offer these switches in our other well known mounting forms that can be installed in control panels according to your design. The multitude of possible combinations of solar panels requires a variety of power-current combinations. Here is a list of representative DC switch combinations: 20A/450V, 25A/450V, 32A/450V, 16A/500V, 25a/500V, 64A/650A, 32A/800V, 50A/800V just to name a few. Salzer is constantly thriving to expand their offerings on DC rated switches through new designs. All load breaking switches from Salzer switch the plus- and minus-pole simultaneously.